Stocky's is answering your requests with the introduction of this specialized single shot model for benchrest and target shooters - the Stocky's® deal Benchrest Stock. 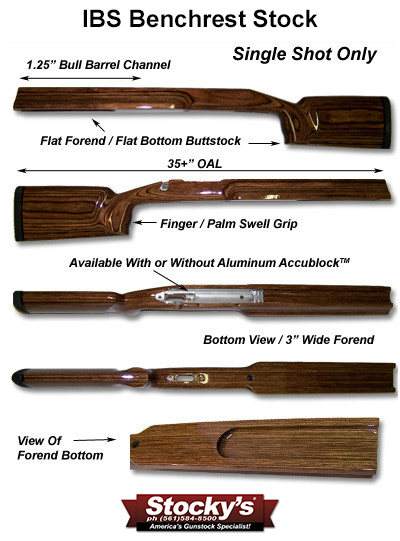 Stocky's® is answering your requests with the introduction of this specialized single shot model for benchrest and target shooters - the Stocky's® Ideal Benchrest Stock. Stocky's Take: These are impressive stocks to say the least. Each and every one is hand-made to McNeal/Stocky's® rigorous specifications. The precision AccuBlock® is CNC machined from 6061-T6 bar stock to .001" tolerences for drop-in accuracy, also available in non-AccuBlock® version for those that prefer wood / epoxy bedding. The blank itself must be custom laminated to achieve the added width and length required by America's most demanding shooters. Pull one out of the box and see what we mean ... the word awesome comes immediately to mind. Stocky's® Epoxy Gel & Pillar Bedding Supplies - New Super-Low Bulk Pricing!